Make your garden & decking areas look fantastic with our decking rope. We supply garden rope by the metre or in a 220m commercial coil in manila, synthetic hemp/polyhemp/hempex & sisal all at discounted prices. We stock it in 16mm, 18mm, 20mm, 24mm, 28mm, 32mm & 36mm diameters at low low prices. Rope is suitable for all garden posts. Please note when using our 3-strand Grade 1 manila & sisal rope it is advisable to pre-soak the rope in a bucket of water for a couple of hours before you use it. 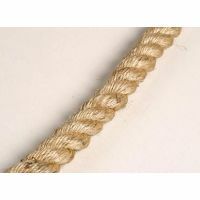 As with all natural fibre ropes it will shrink when wet , then when it dries it will revert to it's original length. 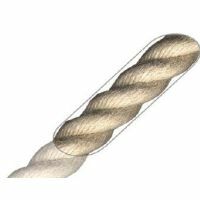 This should be taken into consideration when fixing the rope, also with all natural fibre ropes the diameter can be larger then stated so we advise you to not drill any holes until you have received the rope.. Synthetic Hemp, Polyhemp or Hempex decking rope is a strong synthetic weatherproof & waterproof rope that is made to look like natural hemp, it has a nice soft feel to it and is ideal for any timber decking project. We also supply a full range of decking rope end fittings in a chrome finish, satin finish, matt black finish and brass finish in decking rope hooks, eye plates, rope cup ends and rope handrail brackets in 24mm, 28mm, 32mm & 36mm. If using manila rope outside please treat the rope with a linseed oil to protect the rope from shrinkage and pulling your posts.